The field of joint replacement surgery is constantly evolving, and new technologies are making total hip replacement surgery a safe, viable option for a growing number of patients. Dr. Lige Kaplan is excited to offer the Direct Superior Total Hip Replacement procedure, a micro-invasive surgical technique that incorporates state-of-the-art technology, and has a remarkably high record of successful outcomes. Dr. Kaplan is one of a few surgeons in the country offering this latest muscle sparing procedure for hip replacement. Dr. Lige Kaplan is currently only one of a few surgeons in the Metro-Detroit area offering the revolutionary Direct Superior Approach to total hip replacement. This procedure avoids forcing the patient’s leg into an abnormal position during surgery and prevents damage to any of the patient’s muscles and tendons. These surgical technique modifications minimize soft tissue damage and effectively shorten the requisite post-surgical recovery period, enabling patients to resume the activities they enjoy with less down time. For the direct superior hip replacement approach, Dr. Kaplan will make a single incision on the outside of the hip in the buttock region. This will allow adequate exposure to perform the surgery accurately and with very little soft tissue damage. No muscles are cut during this procedure. Dr. Kaplan will work through the small incision and meticulously work to preserve the muscles around the hip joint, in order to place the hip implant with the least amount of soft tissue trauma as possible. After securely placing the implant, Dr. Kaplan will repair the hip capsule and skin to facilitate proper healing and prevent dislocation of the hip. After surgery, most of Dr. Kaplan’s patients are up and walking with minimal use of an assistive device in as little as 2-4 hours. Most patients have minimal post-operative pain, which can easily be controlled with tylenol and celebrex. Dr. Kaplan has also employed the use of Tranexamic Acid in his patients. This revolutionary medication has been extensively studied in patients undergoing hip replacement surgery. It has been shown to significantly reduce post-operative swelling, bleeding and has virtually eliminated the need for blood transfusions after surgery. In addition, tranexamic acid has been shown to be very safe in the vast majority of patients. Dr. Kaplan’s patients usually only stay one night in the hospital and are discharged to go home the next day after surgery! This new approach requires less muscle dissection, yet still effectively stabilizes the hip region. There are no staples or sutures to be removed after surgery, and patients are not limited by post-surgical restrictions or hip precautions. Most patients are able to discontinue the use of an assist device within 3-5 days after surgery and are walking normally within 2-3 weeks! Unlike traditional hip replacement surgery physical therapy is a typically not needed as there is minimal soft-tissue injury with the Direct Superior Approach to the hip. Obviously, recovery will vary based on individual experience and Dr. Kaplan will work with you to create a customized recovery plan to incorporate physical therapy if necessary. You will learn specific exercises after surgery to help increase your range of motion and restore your strength. What are the differences between the Direct Superior Approach and a traditional hip replacement? One difference is the location of the incision. 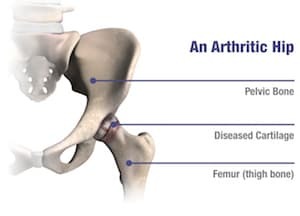 During a traditional hip replacement, the surgeon will make an incision through the IT band, which is a muscle that extends down the outside of your leg from the pelvis to the knee. In a Direct Superior procedure, the surgeon avoids cutting the IT band. Another difference is the length of the incision. Traditional hip replacement may require an 10-12 inch incision while the incision used in the Direct Superior Approach may be 3-6 inches in length. My experience with Dr. Kaplan ( recent right hip replacement using the DSA) was beyond my expectations. Dr Kaplan was reassuring,informative and most importantly did an excellent job. My pain level has been minimal, my scar looks clean, my gait is pretty normal (this is only one week out). I will refer and recommend Dr Kaplan to all! 5 STARS! I have had both hips replaced with Dr. Kaplan and both with the direct approach. AMAZING results! I was back to work with both replacements within 2 weeks and within 4 weeks I was back attending spin classes with zero pain. Great bedside manner from Dr. Kaplan as well, I recommend him highly! Direct Superior by Dr. Kaplan--AMAZING RESULTS!! I had my other hip done by another surgeon through a direct anterior approach. Dr Kaplan did my other hip through a direct Superior. I can honestly say the direct Superior was wayyyyy better. The recovery the so much quicker and I don't have the numbness around my incision like I got from the direct anterior.Dr Kaplan was amazing!! I'm so happy he is doing this approach.